Goldfinger Factory turns reclaimed waste into furniture; it turns, as the owners say, "Waste into Gold". The Factory sits within architect Ernő Goldfinger’s infamous Trellick Tower, a monument to the Brutalist style. It is unpainted, raw, and basic; but beyond the seeming self-effacement is a deeper craftsman’s self-consciousness. It's here we find British artist Loulou Siem’s debut exhibition, Showdown II. The name nods to the artist’s initial inspiration - the spaghetti Western films she remembers growing up with. These films were notoriously ‘bad’, and unconscious of their artifice and falseness. In Showdown II, the artist presents work that raises questions about the creator and her creation, about the viewer and the viewed, and alchemy and value. She creates art that is conscious of its own artifice: across the gallery space are objects that nod to the Western films. 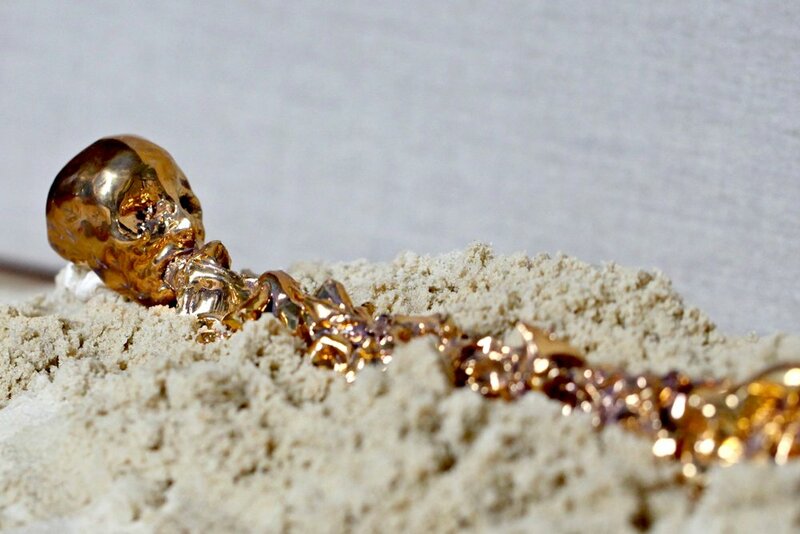 There are sand pits, small cacti, guns, snakes, and skulls; but the sand is from a building site, the cacti are concrete, the guns golden, the snakes hollow, and the skulls small, golden, and disfigured. The works at once demand inspection, but to interpret them can be messy. This exhibition is concerned with the process of creation, of alchemical transmutation, and the mess and grotesqueness of making things. As a result, the works have traces of the vulgarity of creation running through them. In the central sandpit are heads, black and hellish, mutated and pained. They seem mid-creation, thumbed by the artist; but they are complete, too - they are as she intends. They seem to be born out of the oily underworld below the desert; but they are also sucked downwards, just as the middle fingers, the cacti, the guns and skulls are emerging and submerging, created and destroyed. To the right are photos of the black heads in their creation process. They are framed as if on a piece of film. It is an artificial shot of something artificial, and their faces of pain and pleasure become true, somehow, through the play on their possible, and unsuppressed, falseness. The cycle of creation, birth and death runs across the exhibition. In one sandpit is a selection of snake figures devouring themselves; I call them snake figures because, again, these are not snakes - and we are not meant to think they are. They are fragments of the thing, scaly sided resins, plasters and ceramics laying broken in the sand. These symbolic pieces again reverberate with the Wild West theme, like a prop on a Hollywood set, and also, as her sister Sophie Siem points out in the press release, to the fact that ‘the alchemical traditions of Ancient Egypt and Greece used this magical emblem to symbolise the eternal unity of all things’. Next to the snakes, and dotted around the exhibition, are little numbered plaques, which seem to relate to an exhibition catalogue. But they signify nothing. If they do signify something, it is only the question being raised over the gallery space, of the role of the viewer, commercialised art and value. As a viewer here, one is at once in touch with the displays, and removed; there are no clean glass cabinets, but rather sand pits with the feel of a construction yard; as such, we are invited to touch, and yet feel as though we may be intruding on a secret creation space unintended for the onlooker. Out of this construction yard comes gold; and yet, it has never left the place and dirt of creation. 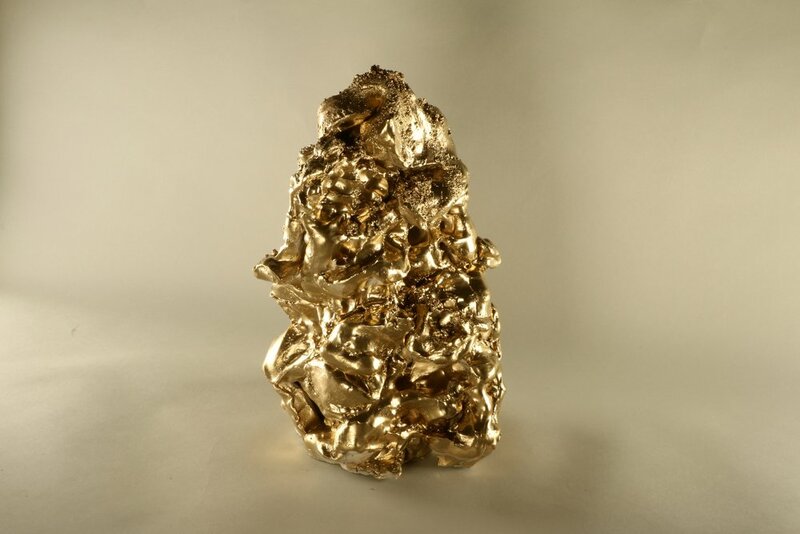 As much as the gold poses questions for us as viewers, it is simply seductive. The fingers, tongues, guns, and phallic shapes and snakes may have lost their function, but they are gilded with a new kind of purpose; their aesthetic and suggestive qualities. This is something Ian Fleming seemed to know, too. When architect Ernő Goldfinger heard about Fleming’s novel, on its way to the printing press, he wanted to sue for defamation. Fleming offered to change the name to ‘Goldprick’ in return. Consciously or not, and with a dose of humour, Fleming taps into something between gold, fingers, and sexual imagery, and his nickname for the architect could make a useful subtitle for this exhibition. The sexual imagery abounds in Showdown II , but the artist says this is more consequential than intentional. Such is the nature of Loulou's subject. Creation is seduction. Creation is a seduction by something, or into something; it is a seduction of the self, and for the self. And so, at the back of the room are two huge portraits, covered by flimsy strands of gold which the artist alikens to that of a peep show; again, the gold invites one’s eye, and yet conceals. Once one pulls the curtains aside, there are two faces, somewhere between pain and pleasure, moving from life to death, or death to life, seduced; on the verge, as it were, of creation.